BERKELEY CITY COUNCIL | Nearly two years ago, East Bay resident John Henneberry sat lonely and patiently at the San Lorenzo Library waiting for a soul willing to just listen to his proposal to right the wrongs of President George W. Bush’s presidency. His plan did not stem from the collapse of the nation’s economy and quickly rising unemployment blamed by many on Bush, but even more serious matters, he believed. Henneberry, instead, wants to prosecute the former president for war crimes and he finally has someone listening. 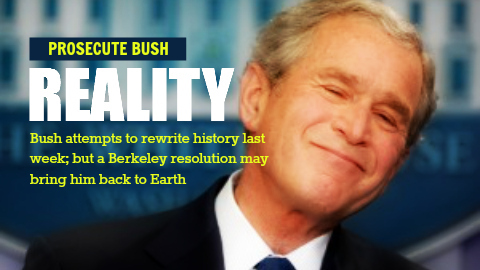 A week after the national press lapped praise on the era of President George W. Bush following the dedication of his presidential library, the Berkeley City Council is poised to bring the two-term commander-in-chief back to reality. On Tuesday, the Berkeley City Council, famously on the cutting edge of passing progressive resolutions and legislation outside the sphere of the East Bay, will discuss a proposal that would instruct the Alameda County District Attorney to prosecute Bush and others for war crimes committed during the Iraq War. The proposal may appear symbolic, but Henneberry believes he has a novel approach—focus the prosecution against Bush only for the deaths of Alameda County soldiers killed in action. In fact, Henneberry’s dogged zeal for the cause has been going on since he read a book by nationally-known attorney Vincent Bugliosi, titled, The Prosecution of George W. Bush for Murder. Henneberry told The Citizen last year the book was the inspiration for his campaign and has spoken and coordinated his efforts with Bugliosi. The Berkeley resolution was first approved last February by the council’s Peace and Justice Commission, 6-2, with one abstention. The Berkeley city manager’s office took no position on the matter, according to the staff report. The legal rationale for bringing the case to the county D.A. stems from an announcement in 2009 the federal government would not seek to prosecute any member of the Bush administration for any crimes allegedly committing during the run-up to war in 2003 and after. Therefore, according to Henneberry and the proposed resolution, Alameda County is the next avenue for prosecution. Eleven Alameda County residents have been killed in the war, according to the resolution. The crux of the argument surrounds allegations the Bush administration deceived the American people over the reasons for invading Iraq in March 2003 and invalidated congress’ approval for military action. Henneberry’s keen sense of right and wrong also extends closer to his Tri Cities home. When Mary Hayashi, the former Hayward assemblywoman was charged with shoplifting from Neiman Marcus in 2010, it was Henneberry who repeatedly called her office asking her to resign. When she ignored his demands, he painted his plea on a large plywood sign and stood on the street corner near Hayashi’s office. He continued his one-man protest even after Hayashi’s staff called the police asking him to leave. Clearly exercising his right to free speech, Henneberry returned the next day and the day after. Posted in Berkeley, Berkeley City Council, Iraq, John Henneberry, Mary Hayashi, Peace and Justice Commission, Prosecute George W Bush, shoplifting, Tri Cities, war crimes. Bookmark the permalink. Please Nancy, do you job and prosecute these war criminals.